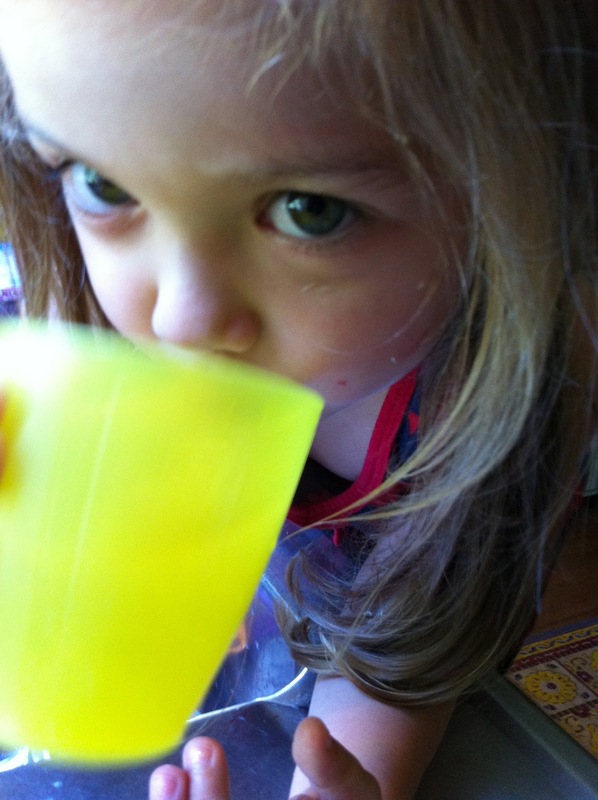 This week we checked off one of the item on our Summer Bucket List, make lemonade. We drink a lot of lemonade around here and it is always one of the items on our grocery list. 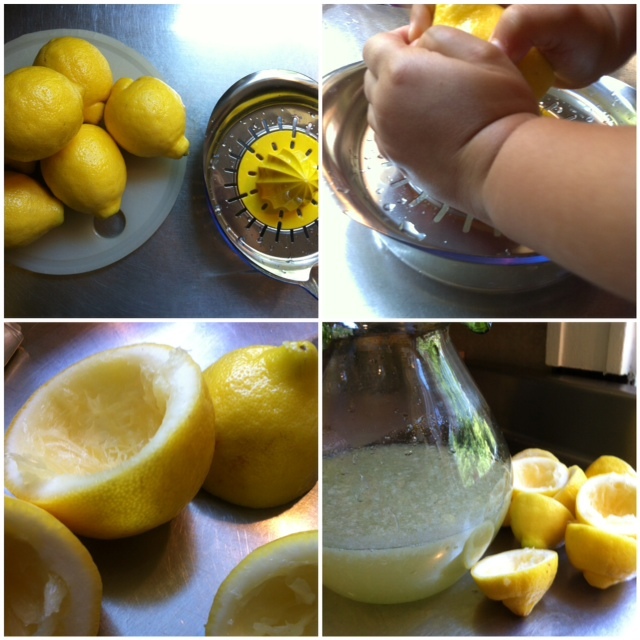 So it was fun to squeeze some lemons and make our own. I found a basic recipe here that started by making a simple syrup with one cup of sugar and one cup of water, which seemed like a lot of sugar to me (I am not a fan of super sweet lemonade.) So we changed it up a little and made a simple syrup by pouring one cup of water into a sauce pan, I then added 1/4 cup of sugar and 1 tablespoon of honey. I stirred over medium heat until the sugar and honey dissolved into the water. Meanwhile the Bee was in charge of squeezing lemons. The recipe called for one cup of lemon juice which they said was about 4-6 lemons. We used 6 which made exactly one cup of lemon juice. I sliced the lemons in half and the Bee squeezed them on our hand squeezer (which we got last winter at Ikea.) It was funny to watch her because she struggled a little bit with the first lemon but by the last one she had worked out a system to push down with all her might in the lemon before turning it to get all the juice out. Once she had finished squeezing the lemons we poured the lemon juice into a pitcher, added the simple syrup and and 4 cups of cold water. We gave the whole thing a stir before pouring it over ice and giving it a taste. It was delicious and the perfect drink for the 100+ degree weather we have been having here lately. I love the whole premise of your blog! I'm featuring this on my Kid's Co-op post tomorrow. Thanks! Great ideas on your blogs! We'd love to invite you to join us at Saturday Show & Tell on Cheerios and Lattes! I know everyone will love your great kid-friendly ideas! Have a great weekend!